We don’t know if we will ever get to carrying a fridge on the bike like in this photo, posted in response to a current Sydney politician’s ignorant and anti-bike comments, but with our new trailer, we will at least have the groceries covered! At the end of that visit, we had approximately 15 kilograms of produce, which easily fit into the trailer. We thought we were onto a good thing when the checkout person loaded it all into a box, ready to lift into the trailer in one easy movement. Unfortunately the box was too wide, but we’ll know next time! The eggs were gingerly placed on top of the pile and the bag zipped up. There was one more small store visit, then we headed home. The shopping was unloaded, including the eggs, which survived perfectly well, and that was it! 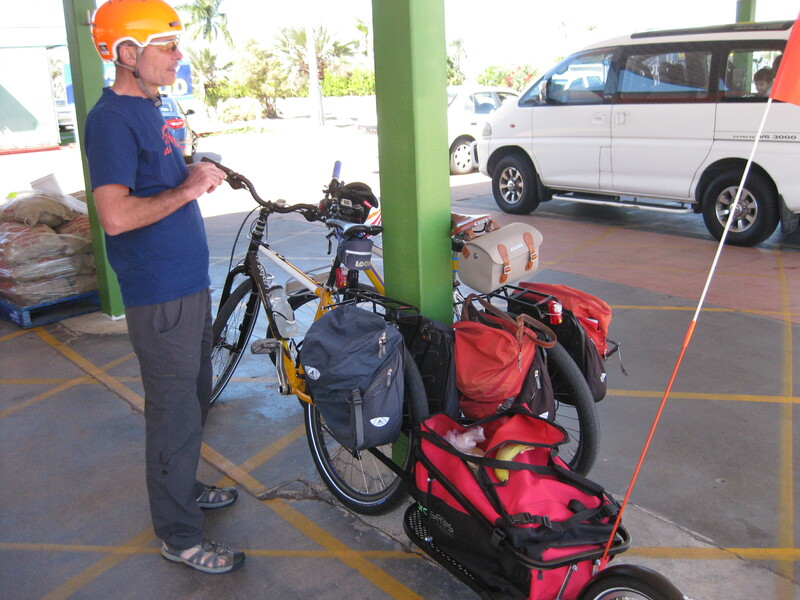 Not only had we performed a weekly grocery shop, we had gone for a wonderfully leisurely bike ride on a sunny winter Sunday in tropical north Queensland. What more could you want? ← Bicycle touring in Style!